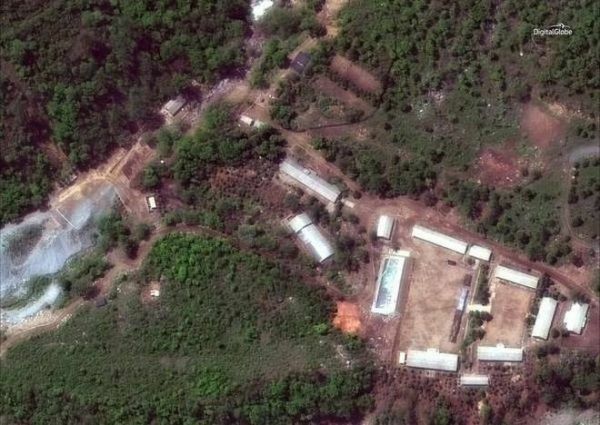 Satellite file image provided by Digital Globe here On may 23, 2018, shows the Punggye-ri test site in North Korea. North Korea has carried out what it says is the demolition of its nuclear test site in the presence of foreign journalists a day later. Sets off explosions over several hours in the presence of foreign journalists. The North’s decision to close the Punggye-ri nuclear test site has generally been seen as a welcome gesture by Mr. Kim to set a positive tone ahead of the summit. Even so, it is not an irreversible move and would need to be followed by many more significant measures to meet Mr Trump’s demands for real denuclearisation.